Often I'm asked where I find the leather I'm using in my crafts. I consider myself lucky to be living in Paris for many reasons. One of them is that I have easy access to everything imaginable related to making and creating. I have a couple of addresses at the Marché Saint-Pierre where they sell leather in any size going from full skins to just pieces of scraps. I've been told these skins and scraps are actually leftovers from big labels like Hermès, Chanel, ... I'm not sure if this is actually true, but I like the thought that I do carry a Hermès bag after all! The department store BHV also carries a nice selection in its hardware department, near the shoe repair supplies. Knowing that this information doesn't help a single bit if you don't live in the Paris area, I have come up with a couple of alternatives. The good thing about these is that they might turn out to be a lot cheaper as well because chances are you might own them already. Leather boots: Did you grow tired of last year's boots? Are they beyond repair? Did your kids outgrow their favorite boots? Don't throw them out yet! Just cut off the shafts and you'll end up with two nice pieces of leather. Leather jackets: Having an outdated jacket you don't know what to do with? Cut it to pieces. If you don't own an old jacket try to find one at a thrift store. You'll have plenty of leather to work with. The same applies to leather skirts and pants. Get out those scissors! Purses and bags: You might be done with that old purse or book bag but before you throw it out, check if there aren't any parts you could still use. I'm not only thinking of pieces of leather but also of possible straps, belts and buckles which might come in handy. Belts: by nature perfect as a strap, the buckle being a nice detail. Sandals (and shoes): because of the straps and often also because of their decoration. They could be transformed in some nice accessories like a bracelet, a brooch, a hair clip, or could be used to add detail to a plain bag. I'm sure you can add a couple more to the list. Now, if working with leather scares you but you do like the idea of recycling leather, then check out this site for quite some stunning bags and purses made from recycled leather jackets. 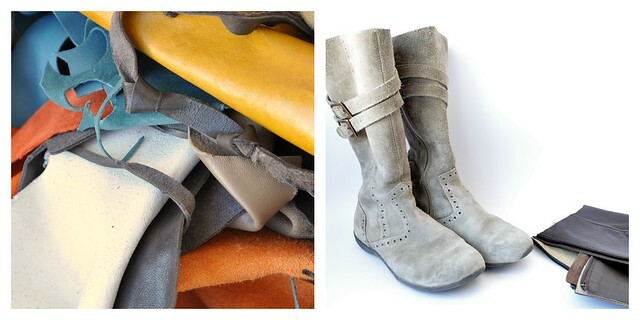 You can find a selection of recycled leather bags on Etsy as well. I especially like this one here. And now, go check out your closets!